Inhambane, Terra de Boa Gente (Land of Good People) is a city located in southern Mozambique, lying on Inhambane Bay, 470 km northeast of Maputo. It is the capital of the Inhambane Province and according to the 2008 census has a population of 65,837, growing from the 1997 census of 54,157. It is a sleepy historic town known for its rusting colonial architecture and has been popular with tourists in recent years. The settlement owes its existence to a deep inlet into which the small Mutamba River flows. Two protective sandy headlands protect the harbor and form a sandbank. The town of Maxixe is located across the bay. Inhambane is one of the oldest settlements on Mozambique's eastern coast. Dhows traded here as early as the 11th century. Muslim and Persian traders were the first outsiders to arrive to the area by sea and traded pearls and ambergris, and they also traded at Chibuene in the south. The area became well known for its local cotton spinning and production by the Tonga tribe. Sometime before the Portuguese reached the area, the Karanga had invaded Inhambane and formed a number of local chieftains. They dominated over the Tonga cotton workers and the rewards of trading with the Muslims went to them. When Vasco da Gama rounded Africa in the late 15th century, he pulled into Inhambane to replenish stocks and to explore. He took an immediate liking to the area and named it Terra de Boa Gente or 'Land of the Good People'. In 1505, a ship sent by Francisco de Almeida was shipwrecked south of the town, but the Portuguese gained an initial meeting with the Karanga chiefs. Later, their sons landed on Mozambique Island to survey the situation. The Portuguese eventually established a permanent trading post at settlement in 1534. Inhambane was then chosen as the first Jesuit mission to Southeast Africa in 1560. The port gradually grew as an ivory and slave trading centre, particularly in the eighteenth century under mostly Indian control. It was destroyed in 1834 by Soshangane, but grew rapidly in the second half of the century as a town of Portuguese East Africa. The old cathedral and old mosque was built during that period. However, in the 20th century the status of the town declined and the economic situation worsened as Maputo (called Lourenço Marques before 1975) became the main centre. The 170-year-old Cathedral of our Lady of Conception is located in the old quarter of the city where a rusted ladder leads to the top of the spire, offering panoramic views of the city and harbor. The city is now home to a museum and a market and is known for its nearby beaches of Tofo and Barra. The central market located along the main boulevard called simply "Mercado Central" offers numerous foods, ranging from a colorful array of spices and vegetables to prawns, fishes and cashew nuts. Motor and dhow taxis sail from the town to Maxixe. The town of Inhambane has one of the largest working fleets of dhows on the Swahili Coast. 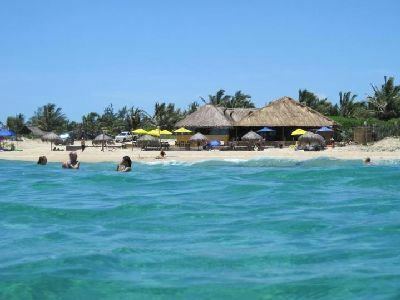 Notable sites in the surrounding district of Inhambane and Vilanculos include Bazaruto National Park, the largest sea park in Africa, the Praia do Tofo, Praia dos Cocos, Ponto do Barra, Ilha de Benquerra, Bazaruto National Sea park, Guinjata Bay. Scuba diving in Inhambane is particularly popular in locations such as Manta Reef and Gallaria. Giant manta rays, whale sharks, turtles and other marine life are regularly seen and there are many professional scuba diving operations throughout the province. Many tourists are under the impression that they can dive from Inhambane itself. The closest diving to Inhambane is actually at Praia do Tofo - 22 km from Inhambane City. Tofo is known as the whale shark mecca of the world. The easiest way to reach Inhambane is by road from Maputo on the EN 1. It is also possible to reach Inhambane from Beira, Mozambique or Zimbabwe on the EN 6 and EN 1 after Inchope. Inhambane has an airport Inhambane Airport and there are flights from Maputo on most days and charters flying in from Johannesburg in South Africa. Inhambane has/had a narrow gauge railway that was terminated before its full extent was realised.